Propan-2-ol has bactericidal activity at 70%. It is effective against C. albicans at 50% in 5 min. Some food-associated fungi require at least 10 min exposure time with 70% propan-2-ol. A tuberculocidal activity has been described for 60% propan-2-ol in 5 min. High MIC values indicating resistance to propan-2-ol have so far not been reported but an increased tolerance to E. faecium is possible. 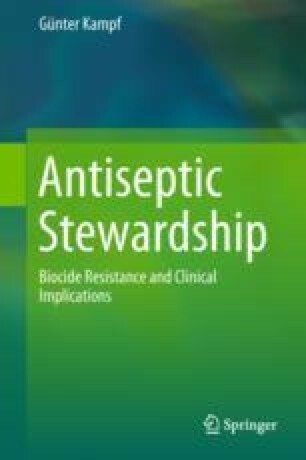 An epidemiological cut-off value to determine acquired resistance has not been proposed yet. No specific resistance mechanisms are currently known for propan-2-ol, and no cross-tolerance to antibiotics has been reported. Low-level propan-2-ol exposure (1–6%) can increase biofilm formation in S. aureus, and 2.5% propan-2-ol can increase surface attachment in L. monocytogenes. Biofilm development of C. albicans can be inhibited by 2% propan-2-ol. The susceptibility to propan-2-ol can be significantly decrease by exposure of E. coli to sublethal concentrations. Propan-2-ol between 40 and 95% can significantly increase biofilm formation in S. aureus. The effect of propan-2-ol at use concentrations on biofilm fixation is unknown. Biofilm removal by 70% propan-2-ol is very low with 0% in P. aeruginosa and S. aureus.